The EC toolset is your Complete Online Content Management System. EC are makers of great websites. Click here today and let EC make the Internet work for you. Gisborne is your gate way to the East coast, discover all the secrets and treasures of the worlds edge. Gisborne city is the capital of the east coast region also known as Eastland, East Coast or Tairawhiti. The Gisborne region is so close to the edge that we are the birth place of the sun making us the first city in the world to see the light of the new day. The people who live here nurture the sun and share their warmth with the rest of New Zealand and the world. The Gisborne Region covers a land area of 8,265 square kilometres on the eastern coast of the North Island of New Zealand. This is approximately 4.9% of New Zealand's total land area. The region stretches from just north of Morere thermal springs andMahia Peninsular in the south to include the East Cape and Potaka township to the east of Opotiki. Our neighbouring regions are Hawkes Bay to the south and the Bay of Plenty to the north west. The people of the Gisborne District. The population of the region was 43,971 at the 2001 census. The provisional figures from the 2006 census shows a slight rise to 44,400 with both losses and gains showing in various district centres. Around 45% of the population are of Maori descent, giving Gisborne District the highest proportion of persons of Maori descent anywhere in New Zealand. Gisborne and the East Coast are among the few places in the country where Maori is commonly spoken as an everyday language. There are throughout the district over 100 Marae (meeting area of a Hapu, sub-tribe or family group, including a meeting house). Around 53% of the population describe themselves as being of European descent, and 2% are of other nationalities. Gisborne is a relatively young district: 27% of it's people are under 15 years of age. Gisborne and Eastcoast tourism operators. Sporting in the Gisborne district. Surf sand and sun in Gisborne and the Gisborne District. Historical edge... How the Poverty Bay and Gisborne edge were first discovered by Maori, and then how Captain Cook sighted land and it became the first land to have contact between Maori and Pakeha (European). But most of all when you actually visit us here at The Worlds Edge you will have experiences that you will not get any where else in the world... You see our dream is to capture your hearts forever. And while we can give you a taste of what you can enjoy on this website it will be nothing compared to experiencing it for yourself. Come and create unforgettable memories. View the Gisborne Region Community Profile. The Community Profile provides information about your local community - Provided byStatistics New Zealand. The EC toolset is your Complete Online Content Management System. EC are makers of great websites. Click here today and let EC make the Internet work for you. New Online Jewellery Shop and Gisborne Cafe - At Bird of Prey we stock an eclectic selection of gifts, jewellery and fashion. Contemporary, retro and vintage inspired homewares, art, stationery and collectibles are sourced from around New Zealand beyond and available at our store in Gisborne or online. Click on the link to view our great links area. 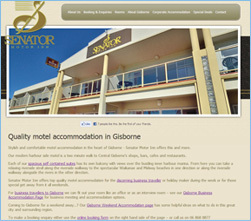 Gisborne's closest motel to the central Business District and Wharf Entertainment Area, Senator Motor Inn is perfect for business travellers, conferences and those weekends away in Gisborne. Everything you need to know about the Coromandel region. Coromandel Online is a website dedicated to the Coromandel region. Providing visitors with everything they could possibly need, from accommodation to history, Coromandel Online has it all. Gisborne's award winning Museum and Art Gallery. Witness the many activities undertaken by the Tairawhiti Museum, showcasing all that they have to offer local residents and visitors to the region. It's a long way from the main stage of Homegrown to a Gisborne Girls' High School music room, but Elemeno P bass player Lani Purkis is giving students the chance to follow her footsteps. THE talk at Victoria Domain is that 2008 is YMP's year, and only one month into the season they've already made history. Gisborne Hospital will empty of non-emergency cases for virtually a week when resident doctors walk off the job tomorrow. The Crown has recognised the mandate of Te Runanga o Ngati Porou to represent Ngati Porou in the negotiation of all their historical Treaty of Waitangi claims, Treaty Negotiations Minister Michael Cullen announced today. This brochure contains 20 pages of information about Gisborne City and the surounding region.